This view looks west on Musser from Stewart Street in the 1940s. The railroad tracks of the V&T can be seen running in the foreground. The Minden branch of the V&T ran down Stewart Street back then, bringing a kinetic energy to what was otherwise a sleepy residential street. One block away is the Capitol grounds; the iron fence can be seen in the distance on the left corner. 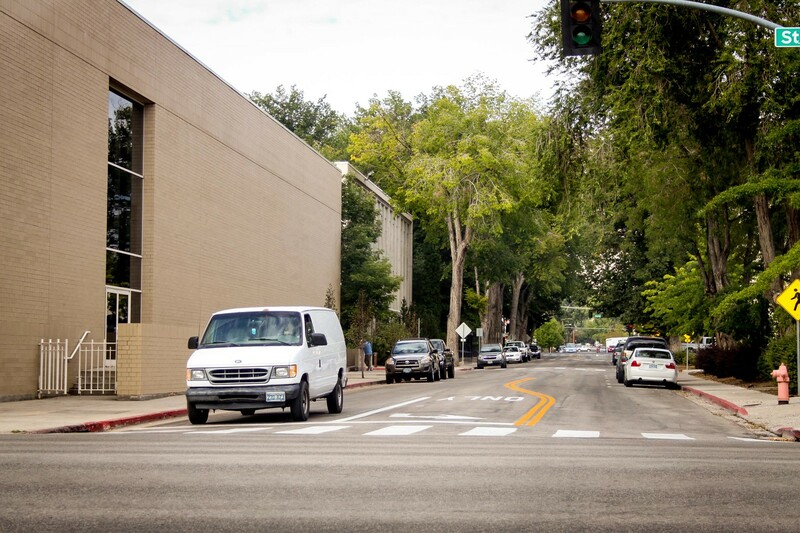 No longer a sleepy street, Stewart is now a major north-south thoroughfare. The only street downtown with a speed limit above 25, Stewart is the street you take when you want to get somewhere quick. The street has been completely urbanized. Once lined with houses, they were all removed for offices, motels, and parking lots. The last house on Stewart was removed in 2011. The Capitol Plaza has also seen major expansion since the first picture was taken. Before, the iron fence surrounded a four-square-block area, and that was the seat of Nevada’s government. Through the 20th century it expanded to the south and east, so that now the Capitol, Legislature, Supreme Court and Library cover 15 full blocks at the heart of town. 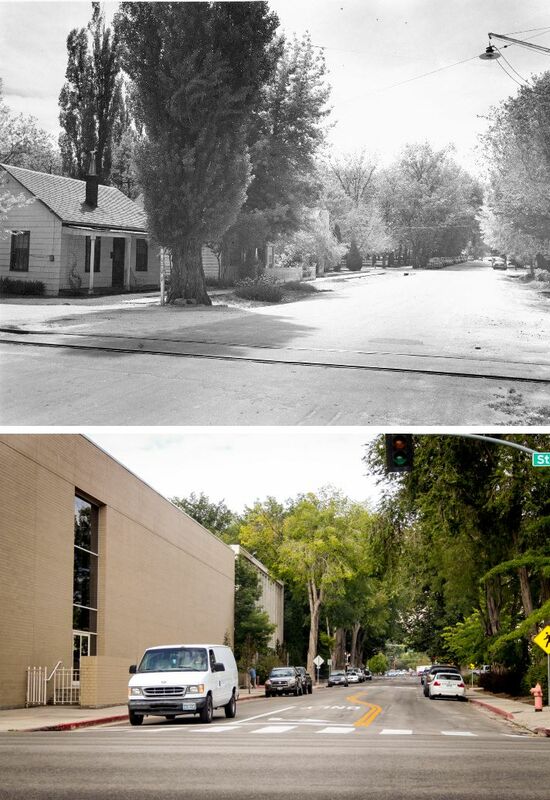 On the left of the new photo the corner of the massive Nevada State Library and Archives can be seen, a hulking edifice that was built in the early 1990s. 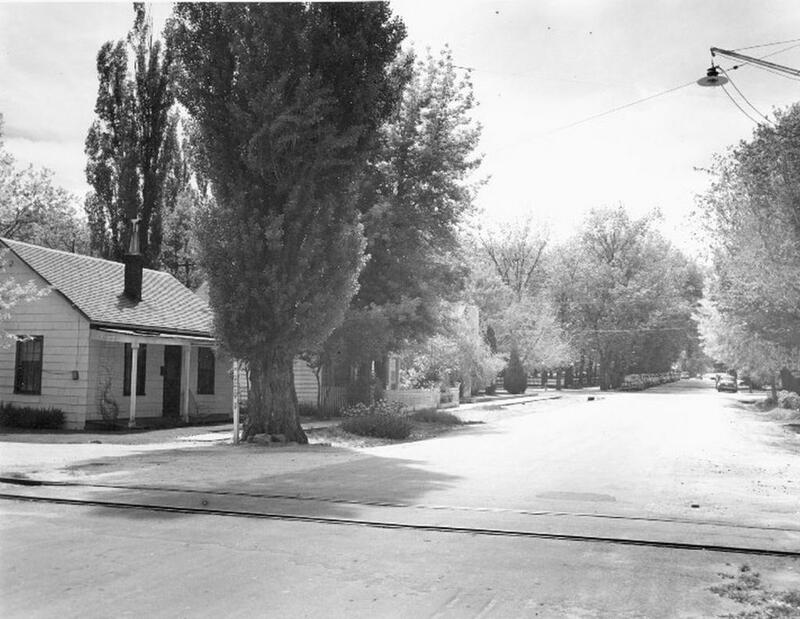 The houses and trees on this corner are long gone, along with many other blocks in the neighborhood. Preservation has kept many of the historic buildings around, but at the expense of smaller ones like the houses along Stewart Street.